St. Joseph's College for Women was founded on June 21, 1948 by Sister Mary Alban, a member of the Religious Congregation - The Institute of the Daughters of the Cross. Pakistan had just been created and the new nation required more institutions for the promotion of education. The College was set up to promote and accelerate the higher education of the women of Karachi. It was started in the already existing St. Joseph's Convent School by making a few of its classrooms available for the College students. Sister Mary Alban, the founder of the College, was appointed its first Principal and the College was affiliated with the Sindh University. With the students already present, Sister Mary Alban began looking for a site on which to build the College. On acquiring the premises, she asked Rev. Bro Hilary Lardenoye OFM, a well-renowned architect, to design the College building which he did blending the old and new, eastern and western style of architecture. The building was constructed with the generous donations, albeit small sums of money, of friends of the Daughters of the Cross in Karachi and abroad, through student dramatic performances and a loan of Rs. 200,000. On 13 July 1951, the newly-constructed College building was blessed by the Most Rev. Alcuin Van Miltenburg OFM, Archbishop of Karachi and Apostolic delegate to Pakistan and officially opened by Begum Baig the wife of the Administrator of Karachi. As Karachi had by now its own University, the College was affiliated in 1951 with the University of Karachi. Records show that the College started with a few students admitted to the faculty of Arts. By 1950 the College had grown to 94 students of which 14 were Christians, 72 Muslims and 8 Parsees. The Science faculty was added in 1951 as science laboratories had been built. From the beginning, emphasis was placed on a holistic education. In 1950 the first dramatic performance of the students of the College- Shakespeare's A Midsummer's Night Dream- was presented in front of a general audience and raised Rs. 2,000 for the College building. Sports were also encouraged, with the College grounds becoming the venue of the Sindh Olympic Netball Championship in 1951. In 1952, Sister Mary Alban's health weakened and she returned to England. Sister Mary Bernadette was appointed Principal. Sister Mary Bernadette remained at the helm of affairs until 1961. During her tenure the College started the Bachelors in Science program. she continued to ensure the students received a quality education, herself teaching the subjects of English and history. In 1961 Sister Mary Emily was appointed Principal of the College. In 1963, seeking to provide better facilities for the students, she had a Microbiology Laboratory and the Common Room constructed. 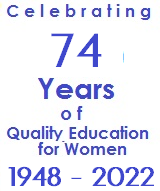 During her tenure the College, along with all other Colleges in Pakistan, was nationalized on September 1, 1972. Sister Mary Emily continued as Principal until 1983. From 1983 to 2005 Mrs. Bilquis Iftikhar, Mrs. Munira Gulzar, Mrs. Kaniz J. Abedi, Mrs. Shahnaz Parveen and Prof. Dr. Tanveer Anjum successively held the office of Principal. On May 7, 2005 St. Joseph's College for Women was denationalized and returned to its legal owners: The Institute of the Daughters of the Cross. Once again Sister Mary Emily took charge as Principal. Efforts were made immediately to improve the condition of the existing building and increase facilities by building additional classrooms. A demand by young women for an education in commerce led to the addition of the commerce faculty to the humanities and science faculties already in existence at the College. In recognition of the services rendered by Sister Mary Emily to education in Pakistan the government of Pakistan awarded her the 'Sitara-i-Imtiaz'. In 2009, Ms. Mary Caleb was appointed Principal then in 2010, Prof. Dr. Bernadette L. Dean, an alumnus of the College, was appointed Principal. In keeping with the tradition of providing a holistic education stress is laid on ensuring a value-added academic curriculum is taught and students are provided opportunities to participate in a variety of co-curricular activities that serve their development as ethical persons, independent thinkers and responsible and active citizens. In 2013, Sr.Roohi Ghouri was appointed as Principal. Students are provided with the possible opportunities in preparing them to be good citizens. Throughout its history the students of St. Joseph's have demonstrated outstanding performance obtaining merit positions in both the Intermediate Board and Karachi University Examinations in all the programs of study offered by the College. Their outstanding performance has also been reflected in various co-curricular activities. On the sports field the College has been a regular recipient of the General Championship of the Inter-Collegiate Tournaments winning the volleyball, table tennis, badminton, throw-ball and athletics competitions. They have also excelled in both English and Urdu debates and declamation contests held at both the Intermediate and University levels.